Indonesia Through Their Eyes – Where in the world is Kelly? Last week, my fellow ETAs and I gathered in Jakarta for the annual mid-year conference. It is always a pivotal time: we are halfway through our grants and beginning our second semester of teaching with more experience and skill in bahasa Indonesia. Mid-year is a time to refresh our skills and our mindsets and (of course) have fun with our friends! Like last year, Indonesia Through Their Eyes was a major highlight of the entire mid-year experience. The official flier for Indonesia Through Their Eyes. 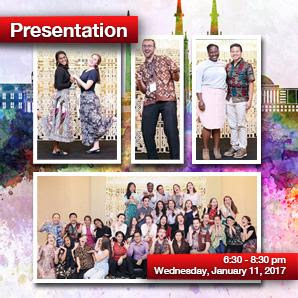 On Wednesday, January 11, 27 Fulbright English Teaching Assistants (ETAs) and their co-teachers gathered in Jakarta for an evening of talent, humor, and cultural exchange at an event called Indonesia Through Their Eyes. As the title suggests, ETAs were tasked with creating a performance that showcased what they have learned during their first five months of living in Indonesia. Given one month to prepare their performances, ETAs in cities spanning nearly 2,000 miles worked hard to put together a memorable evening. They planned skits, made videos, learned local dances, and even prepared for a traditional wedding. On January 11th, as the ETAs and their co-teachers made their way to the @America venue, the excitement and nervousness of the performers was palpable.